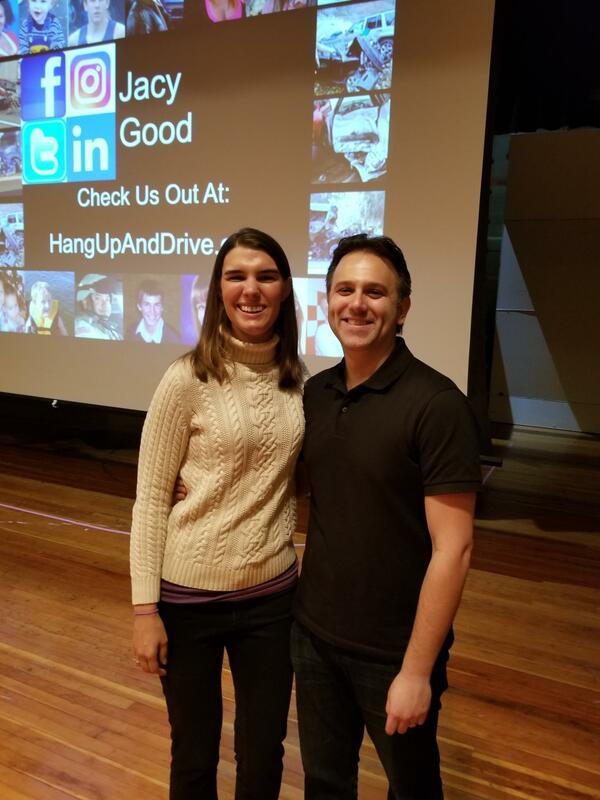 Recently, the students at Solvay High School were fortunate to host Jacy Good, public speaker and safe driving advocate, and her husband, Steve Johnson. Jacy Good graduated from Muhlenberg College in May 2008. As she and her parents drove home after the graduation ceremony, a teenager – who was driving and talking on his cell phone – turned left through a red light, causing a fully loaded tractor-trailer to swerve and hit Jacy’s family station wagon head-on. Jacy’s parents were killed instantly. Jacy was severely injured and went through months of rehabilitation. Since that time, Jacy has worked tirelessly to help enact distracted driving laws. She and Steve also travel around the country telling their story. Jacy and Steve told their story in a light-hearted and at the same time powerful way. Students and staff were transfixed by the account, and walked away understanding the importance of not being a distracted driver. Hopefully, the duo’s message will resonate well into the future for both staff and students. A big thank you to Deputy Poland of the Onondaga County Sheriff's Department and AAA of Western and Central New York for sponsoring this event.